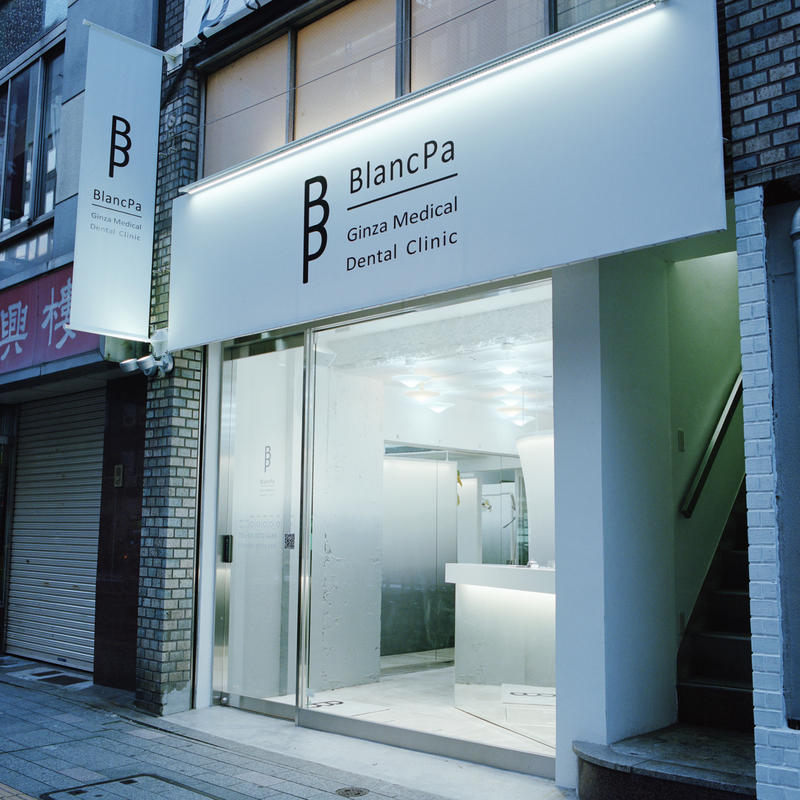 We designed the logo, sign, and interior for a new dentist's clinic opening in Ginza. The surfaces of the clinic's interior were all gray from floor to ceiling (the raw building materials, such as concrete and mortar, were exposed). We changed the color to white by coating everything with paint in different gradations. Eventually, the entire inner surface, including all the different building materials, became harmoniously white, which expresses the beauty of whiteness and uniformity. Gray sections were sprayed with thin layers of paint, which shine when lit, to give the impression of silver. We produced specialist lighting equipment and installed it evenly across the ceiling, in order to highlight the gradations of whiteness from floor to ceiling. The lighting not only faces downwards to light the lower half of the interior but also upwards to illuminate the ceiling itself. This lends a sheen to the white on the ceiling and the upper half of the walls, as well as emphasizing the gradations of whiteness. The clinic is located in an area that reflects the local flavor of Ginza. It is surrounded by galleries and antique and art dealers. The site where the clinic was built used to be that of an art gallery. We thought about how we might give the impression of ceaselessly inherited beauty by retaining the atmosphere of a gallery, which is a part of the site's history, and acknowledging the culture of Ginza; a place that sets the nation's art and fashion trends. In order to achieve this, we decided to hang three old frames that had been painted in the same gradations as the walls. Within these discarded and weathered frames, we placed landscape paintings covered top to bottom in a white mist that complements the gradations of the walls. The pictures hang within the clinic, not as decorative ornaments, but as reminders of the history that permeates the building.